Hello all, I'm Lesley Stevenson. Some of you may have seen me selling my home-grown, seasonal flowers at The Vintage Village in the past. I know some visitors called me 'the flower lady', which I think is lovely. Some of you may even follow me on my Facebook page Watch the flowers grow or on Twitter @flowerythings. I'm an artisan flower grower and florist and most of my work is for weddings or events. I only sell what's in season. Why do I grow my own flowers? Well, they're fresher, they have beautiful scent, they're not sprayed or grown with chemicals and I can grow a greater variety of flowers and herbs, many of which you won't find in most florists, and definitely not from the supermarkets. Also, no air miles. They truly are vintage flowers; flowers like they used to be. It's not just me though. There's a few hundred of us British flower growers around the country now, which is great, because we can now source from each other. I know people come to The Vintage Village from all over the country, so if you want to find your local British flower grower/florist take a look at Flowers From the Farm. As Finder of the Fair this month, I've got a bit of a flowery/wedding/spring theme going on . . . I loved selling my flowers at The Vintage Village, and loved having Keith Simcock as my 'stallie' neighbour. I'd be the first to dive into his vintage bottle and old pot collection. I'd buy a few, and often borrow a few, to help 'style' my flower stall. They're perfect for vintage weddings and I know Keith has sold to a number of brides who were DIYing their own weddings. Old glass bottles, that Keith himself has unearthed from Victorian dumps, start from £1.00. There's something about lace that captures the essence of vintage and I know I'll be back to buy some from retired PE teacher Maureen Woodman. The trend for vintage wedding styling looks set to be around for some time to come and I'm sure I'll be asked for more lace tied wedding bouquets again this year. Compulsory eating whenever I visit The Vintage Village. What a great Stockport business this has become, all down to the hard work of Lesley, Lindsay and Oliver. 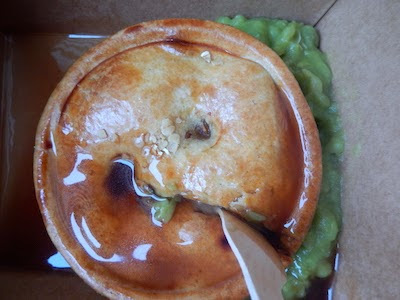 My favourite pie is 'The Stockport'. I'm always on the look out for props to style my flower photographs. If I spent less money on style props, I could probably afford a new camera lens to take better pics! 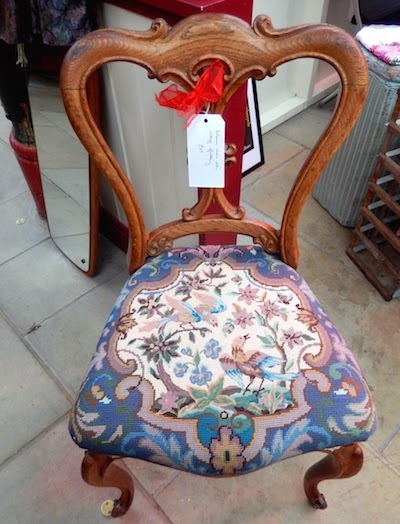 This elegant chair, being sold by Caroline Eadsforth of Novo Chic, caught my eye. It was Caroline's first time selling at The Vintage Village. I was very tempted, as it would be a perfect backdrop to photograph a seasonal bouquet. I resisted. But I may be back next month! I'm not a big fan of vintage brooch wedding bouquets - obviously, I prefer fresh flowers! But it's quite a fashionable idea for a bridal bouquet at the moment and many brides make their own. 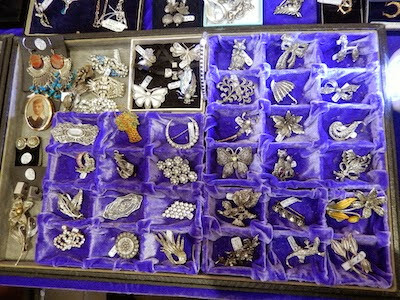 The Vintage Village would be a great source of brooches for them. Sue, of Sue Booth’s Sparkle, has some really pretty brooches from about £3.00. Sue actually specialises in Whitby Jet, which has been a popular material for jewellery from the third century and is still popular today. My mum is a bit of a collector of it and would love to see Sue's collection. 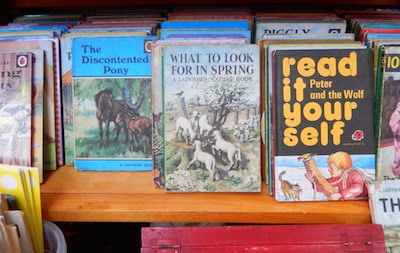 What's not to love about a Ladybird book? Recognisable at a distance; a mere glimpse of a cover - if you're of a certain age, anyway - propels us back in time. For some reason I had a lot of religious Ladybird books growing up and still vividly remember the dramatic cover of David and Goliath. What To Look For In Spring leapt out at me because at this time of year I itch to start sowing flower seeds again, and every day I watch for the signs that Spring is on its way! Spring may be just around the corner, but, oh boy, it can get chilly in Stockport Market Hall on a grey day, even when it's full to the brim with visitors. I went in search of an extra warm layer and got sidetracked by the floral print dresses being sold by Bus Stop Vintage. I loved the indigo blue of this dress and the detail of the print and for a brief moment imagined myself wearing it, flitting amongst my summer flowers - the reality of it is that the dress was far to good for the grubby work of flower growing. Marie, of Bus Stop Vintage, was also selling a number of 'right on trend' Aran cardis. Just what I'd been looking for, and at £5.00 each I can't believe they haven't all been snapped up! Back in the 1800s fishermen on the Aran Islands started wearing these knitted sweaters to keep warm and dry - sheep's wool being naturally water-repellant. As it happens, I did once flit between the Aran Isles and didn't see a single fisherman wearing these iconic knits. My vintage find, however, keeps alive the history and romance of another time before Gortex. 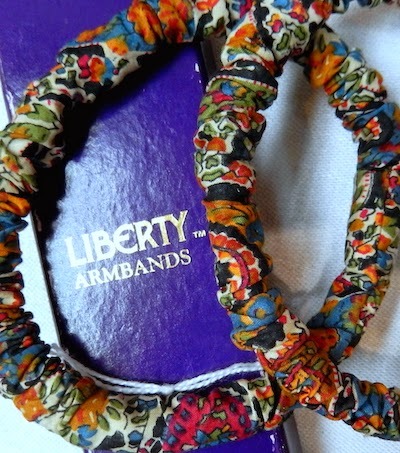 Liberty print! Love it! Jess at Windmill Lane Vintage was selling these armbands for £6.00. I actually once had a pair of these, which I bought in the 80s from the small Liberty shop that used to be on Kings Street in Manchester. I'd just got my first job as a journalist for Piccadilly Radio. I used a manual typewriter to write the news and these arm bands seemed so cool, yet brought a touch of femininity to a more masculine, smoke-filled world. 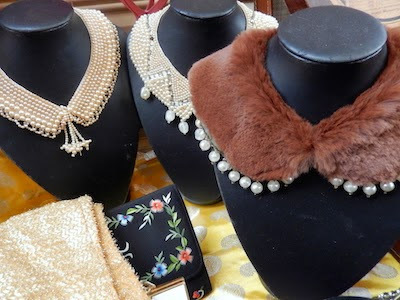 Mary Jones Vintage has some amazingly stylish vintage items. Julia, who runs it, is a lawyer by day. Some of Julia's other items for sale have already been featured in previous Finds of the Fair. Everything is in such wonderful condition, and the quality of the materials and crafting is impressive. I really liked these collars - and only £30 each! I think they'd work well on a boho bride with a simple silk dress and flower crown!! But they are so versatile that they'd look stunning worn at any special occasion, or maybe just a trip to the shops! Why not? Snygg has moved from the main market to the nearby 20th Century Stores since I last visited. If you're into mid-century, then there's plenty here to get excited about. These single-stem German bud vases, or 'solifleurs', are from £10.00 each. Trouble is, I wanted the whole collection. Oh, and also one of their lampshades, which are covered in fabric with 50s abstract designs made popular by Lucienne Day and her work with Heals of London. A seasonal May bouquet created by Lesley, POA. Thank you, Lesley, for such a delightfully floral and wedding-themed selection of Finds! We're all eagerly looking out for the first flowers of spring now! If you think you would like to have a go at being our Finder of the Fair - all you need is a camera, notebook, pen and impeccable taste! 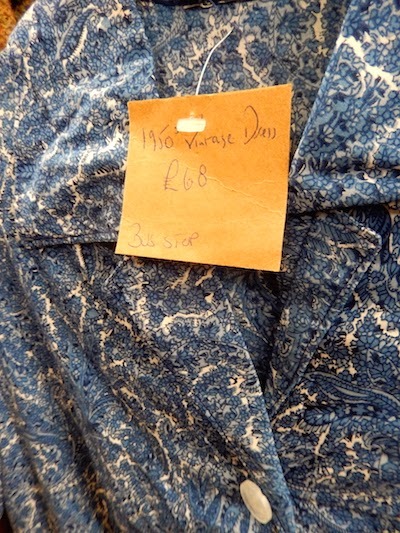 - please get in touch via our contact form here, or on our Facebook page, or on Twitter @Vintage_Village.